"A quick and easy blueberry sheet cake that is not overly sweet. You can make it with fresh or frozen blueberries and it's great if you're serving lots of people. If you like the cake to be sweeter, dust with more confectioners' sugar." Preheat oven to 350 degrees F (175 degrees C). Grease a rimmed baking sheet. Beat eggs in a large bowl with an electric mixer until foamy. Mix in sugar, oil, vanilla sugar, lemon juice, lemon zest, and salt. Combine flour, baking powder, and cinnamon in a bowl. Stir flour mixture and milk alternately into egg mixture until batter is well blended. 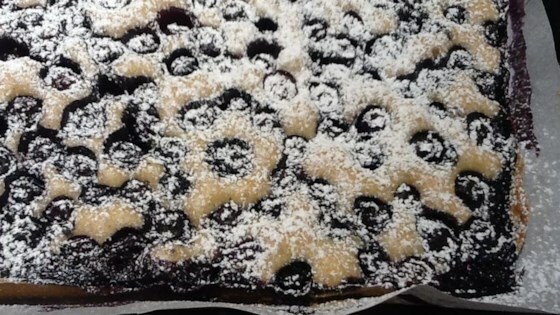 Spread batter onto the prepared baking sheet and distribute blueberries evenly on top. Lightly press into batter. Bake in the preheated oven until toothpick comes out clean, 20 to 30 minutes depending on the size of the baking sheet. Cool cake completely, 1 to 2 hours. Dust with confectioners' sugar and cut into squares. You can make your own vanilla sugar by sticking scraped-out vanilla pods into a jar of sugar and waiting a couple of weeks. I just add any used vanilla pods to the jar. Or you can leave it out. In that case just add a couple of teaspoons more sugar and a bit of vanilla extract.